Previous version Waze 4.20.0.1 apk for Android will help you to downgrade or install older app easily. This is one of the best Tools apps. This app connecting their driver member from one to another by improve every member daily quality driving. This will make them prevent from frustration during their traffic, find clue in avoiding police trap, and even cut minutes from their regular route commute from knowing new routes from other drivers that they are not ready know. To use this app is easier as they starts to download this app. The other active driver action, they can report to any accidents, police issues, and any trouble and hazards in a long way to help other drivers know on what the up come when they pass the same road route. The app also feature with major events that make you able to avoid pass the road where the events is take place. The app live map will be great navigation system for all drivers member. They are able to detect any traffic in their next road route. 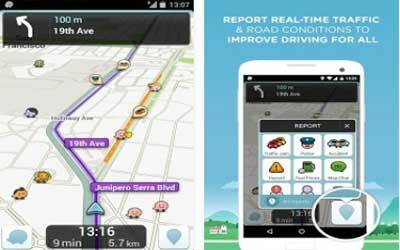 Download Waze Social GPS Maps & Traffic for Android that very useful for your next trip and daily driving activity. Introducing Google Smart Lock for Waze: Never worry about remembering your Waze login details for your next phone. Opt-in to Smart Lock and you’re automatically signed in, with all your settings and points saved. Friends and Inbox have a new home: Now, see whether you have new inbox messages and Waze friends online in your Waze menu navigation list. If you do, tap to your My Waze screen to read them and see who’s there. Great traffic beater! I use it to navigate everywhere just so it reroutes me around traffic.